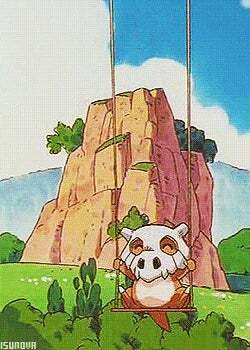 Crying is Not Optional - Cubone! Pokemon One a Day! 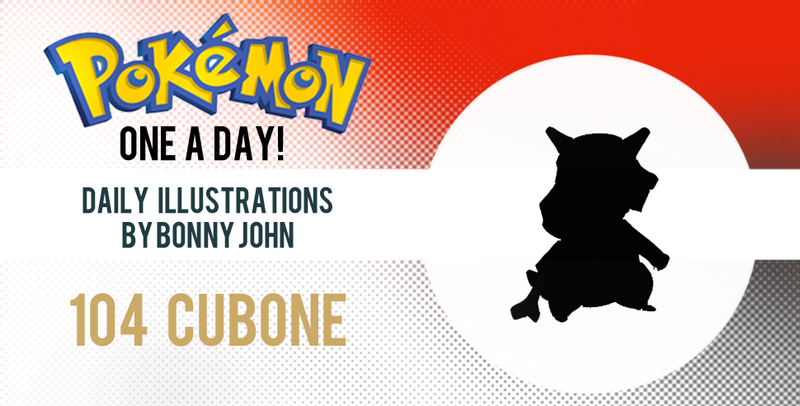 As the lonely Pokemon, Cubone's story is tragic and I suppose it needed to be explored as a theme for the art. They say that Cubone's real face has never been seen, but that's the dumbest thing I've heard - Nowadays, gamers breed their own Pokemon, using Ditto as a mother/father with the species they want. I'll carry an egg around and let it hatch, and if I see a bone helmet on it's head at birth, I'll be damned. Otherwise, I'll be sure that Cubone doesn't "accidently" off me and take my skull to go on and fulfill his destiny as the lonely Pokemon. So anyway, I originally began the work as something cartoony. The original skull was "chibi-fied" but I dropped it over time because it didn't match up with the backstory. Cubone could be chibi, but the skull belonging to the mother should be contrasted against the style. Eventually I dropped the toony look and started rendering it semi realistically. Even further down the line I rendered out the helmet to quite a degree. I had no idea how to take the art visually - I needed something new that none of you have seen in a style done for this series. I examined the situation this Cubone was in. He had just picked up his mother's helmet, protecting himself from the dangers of the world and hoped no one would see his tears. The bone in front of him could tell of two routes this creature could take - he can pick up what's left of his mother and fend himself against the terrors of the world, or bury it and lie with the grave he dug for the person he loved the most. The setting and atmosphere was set - I started to sketch in details over a Cubone who I thought was already near done but far from it - the very loose, scratchy strokes represents a Cubone clawing his way out of his hole. 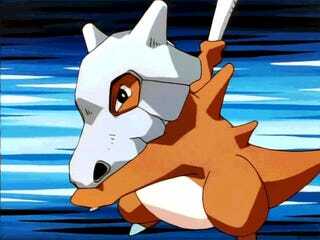 This Cubone will pick up this bone, one of two gifts left by his mother to defend himself and learn to fight for one of two things : revenge against the world and crush everything who comes across his way, or protect others who need aid from the terrors of the world, as he did before this moment. That wraps up today's art! Which route would you like Cubone to take? I'd prefer the way of the super hero. Thanks as always for viewing and reading (and crying, here's some tissues), I always appreciate you stopping by!